Best Home Budget App for Android, iPhone, & Web | Goodbudget Goodbudget | Budget well. Live life. Do good. A budget tracker for the modern age. Say no more to carrying paper envelopes. This virtual budget program keeps you on track with family and friends with the time tested envelope budgeting method. A budgeting system proven to help you save for big expenses and pay off debt. Track Envelope and Account balances on the go and seamlessly sync your spending with multiple devices and to the Goodbudget website. Budgeting is more than pinching pennies and building nest eggs. This budget software helps keep you accountable to the goals you set, allowing you to live out a budget that truly reflects what's important. Over the years, we've seen Goodbudget and EEBA, the Easy Envelope Budget Aid, help thousands of people stick to a budget. You'll save for big expenses, share budgets with the people who matter most—with cloud sync-enabled apps—and create a budget that actually works. 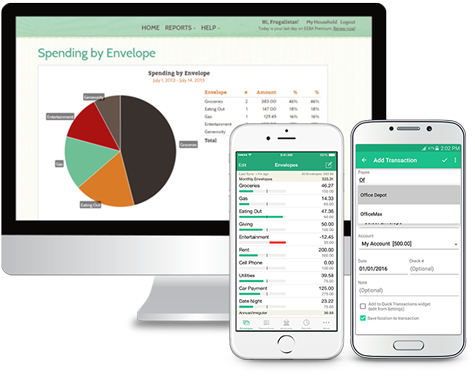 With the foundation of the time-tested envelope budgeting system, the Goodbudget app for Android and iPhone is chock full of powerful features without compromising simplicity. On the go. Always up-to-date.